Looking for a great appliance for your home, kitchen, or commercial space like your shop or restaurant?! Want to buy a truly awesome, cutting-edge, unique gadget that will prove most useful than any other?! i) Vacuum Cleaning Robots - These are the most widely used. They clean your carpets, and your hardwood, tile, vinyl, linoleum floors. They remove the dirt, dust, debris, and the advanced models feature specialised brushes - to remove pet hair - and air filters for filtering fine dust and allergens from the air. ii) Floor Scrubbing Robotic Vacuums - These are ideal for kitchen, bathroom, entryways and other high traffic areas that need frequent care. They wash, scrub and squeegee sealed hardwood, tile and linoleum floors, to remove stains, dirt and grime. iii) Floor Mopping Robotic Vacuums - They dry sweep, or wet mop all your hard-surface floors including tile, vinyl, hardwood and laminate, picking up dirt, hair and dust in the process. Apart from these, there are also Pool Cleaning Robotic Vacuums, Window Cleaning Robotic Vacuums, and Gutter Cleaning Robotic Vacuums. Check out the best gift for home and business. I present to you a handpicked list of the best robotic vacuums. - and 2 Virtual Walls to block off-limit areas and keep the Roomba cleaning where you need it. Amongst iRobot's high-end vacuuming robots, the 770 offers the best value for money, with a great combination of features and price. and iRobot Roomba 880 - the newest model, delivers the maximum cleaning performance with less maintenance. - and the feature to return to the charge base when low on power, and once charged, to resume cleaning where it left off. The Neato XV Singnature Pro is a high-end vacuum robot from Neato. It lacks a remote - so when its working you need to follow it around to press a button on it; is a bit louder than other brands; and it lacks side brushes - for corner cleaning. It scores over others in more streamlined navigation, and with its feature of returning to charge base when low on power and resuming cleaning where it left off. Amongst all vacuuming robots, I'll place the iRoomba 770 higher, on overall performance and user satisfaction. - high cleaning performance ratings amongst robotic vacuums (as per a German appliance test magazine). iClebo is a new entrant in the U.S. market, popular in the Far East / European markets. Its robotic vacuum has impressive test results, and good looks. It cleans good, vacuums as well as mops, makes low noise, consumes less energy. What is unknown is does the iClebo perform equally well beyond the warranty year - does its perform reliably for years. - gives you hassle-free cleaning - just fill the robot and press 'Clean' - the proof is in the tank. The Scooba uses tap water, water and vinegar, or Scooba Hard Floor Cleaner - Natural Enzyme Formula, to wash floors. and iRobot Scooba 230 - instead of separate tanks, it uses a partitioned bladder to keep cleaning solution separate from dirty water; for smaller areas like bathrooms; its technology is older than the 390. Both are older models, and the Scooba 450 features vastly improved cleaning performance than them. - Picks up dirt, pet hair and dust from all your hard-surface floors including tile, vinyl, hardwood and laminate. - Braava's whisper-quiet operation means your pets won't be bothered while it cleans. - Its smart sensors avoid stairs, area rugs and raised transitions to carpet. - Its Perfect Edge technology allows Braava to clean right along the walls and edges, and around chair legs and other obstacles for a complete clean. - Features advanced navigation that allows it to move between rooms to clean the floors. Just attach a dry or pre-moistened disposable cleaning cloth, or the unique Reservoir Pad with a Pro-Clean microfiber cloth (included), set Braava down, press either the Sweep or Mop button and let it clean! After cleaning, simply dispose of the cleaning cloth or wash the microfiber cloth for use later. iRobot Braava 320 - features single room navigation; smaller coverage area; and doesn't have the Reservoir Pad feature of the 380t. - Scrubs, vacuums and filters, all pool surfaces - pool floor, cove and walls. - Prevents any dirt or algae buildup. - Comes with easy-to-clean filters - a cartridge filter to remove the dirt from the pool, and a spring clean up filter for heavy leaf and debris. - Patented, 60 ft. long swivel cable, helps prevent tangling. 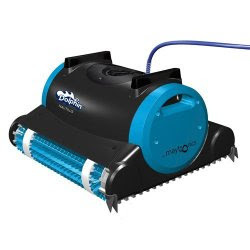 - Easy-to-use, with exceptional performance, recommended for pools up to 50 ft. in length. Pros: reliable performance; easy to clean; value for money. Cons: doesn't clean benches or steps; doesn't come with a remote; and occasionally when lifting it from the water, a little of the debris it has cleaned fall back into the pool. Albeit in the high-end range, iRobot offers iRobot Mirra 530 Pool Cleaning Robot, that has better cleaning technology, does a better cleaning job, and climbs & cleans steps too. - has older cleaning and filtration systems, and Dirt Detect technology, than the iRobot Roomba 770. Amongst iRobot's mid-range vacuuming robots, the 650 offers the best combination of features and price. 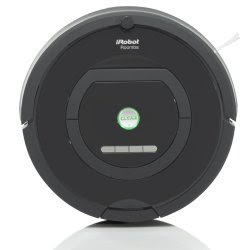 iRobot Roomba 630 - it doesn't have the scheduling feature; all other features are the same as 650. - XV-21 has the same features as the high-end Neato XV Signature Pro, with one difference - the Signature Pro has two high performance filters, the XV-21 has only one. XV-21 is Neato's mid-range robotic vacuum. Neato XV-12 Vacuum Cleaner - has 2 standard filters, not the high performance ones; and doesn't have the specialised combo brush for picking up pet hair, present in Neato's higher range models. A great gadget for the elderly parents, grandparents, the housewives, the man of the house. Makes a great gift on birthday, anniversary, christmas, baby shower, fathers day, and mothers day. Robotic vacuums add to your comfort, and they take the drudgery out of keeping your home clean. Gear up for spring cleaning with these cool robots! Wish you loads of free time, lots of comfort, and more freedom from the daily chores & the daily grind.